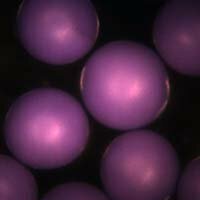 Violet (purple) polyethylene spheres are available in fluorescent or non-fluorescent options. Particles with density of 1.00g/cc offer exceptional performance as flow tracer or seed particles in Particle Image Velocimetry of aqueous solutions and similar applications. These spheres offer high visibility, sphericity, fluorescent response, and density designed for suspension. Custom sizes, colors, volumes and densities are available by request.